Dear Friends,Happy May Day! May Day, also known as "Beltane", is one of the most magical days of the year. 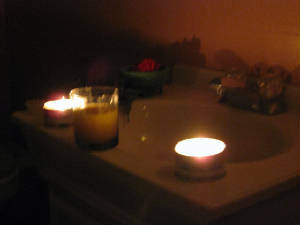 To celebrate, I created & took a magical herbal purification bath for myself. The purpose of this magical purification bath is actually to purify sorrows & ills of the past, and to help heal a broken heart. Also, it cleanses the aura of any negative effects stemming from long term discouragement, illness, or day-to-day struggle. In case you'd like to take a "Healing Purification Bath" yourself, I'm including the recipe below for you. Enjoy! If no lavender powder is available, you can omit, or substitute a few drops of lavender oil at the time of taking the bath. Thyme & Marjoram are the basic ingredients that "drive" this recipe. Taken together as an infusion or a tea, or worm in a sachet, they remove the emotional sorrows & ills of the past. The cloves are used to bring comfort to the bereaved. The lavender powder imparts peace & happiness. The fresh ingredients add an extra "zest". The dried lavender flowers (or the substituted lavender oil) lends a vibration of peace, comfort, and rest. The rose petals (preferably fresh, if available) are powerful "soothers" as well. They help to call back a soul from the verge of broken-heartedness or discouragement. Depending on the color, the rose petals may also do other things as well....for example, red roses can stimulate romantic love, or reinvigorate a person's passion for living. Yellow roses can ease problems in relationships, and increase positive thinking. Every color has its significance. Your intuition will lead you as to which colors are right for you. Taken as a whole, in any color, rose increases ones capacity for unconditional love, and strengthens the ability to receive love from others. The sage is actually added for protection. A discouraged or broken heart is very vulnerable, as is the heart of any one who is purifying emotionally or spiritually. Therefore, the sage helps to strengthen the auric shield, and protect the heart from getting hurt again while it is in the process of healing. Mix the dried herbs together (thyme, marjoram, cloves, and optional lavender). Use a wooden or bamboo spoon, and stir counterclockwise. As you stir, softly chant to yourself an appropriate affirmation or phrase to state your intention for what you wish to accomplish by taking the purification bath. Some examples: "Purify, Heal, remove all my sorrows & ills!" Or, "Heal this broken heart, help it to re-start! Bring me back my inner steam, wake me from this hurtful dream!"" Or, "Sacred herbs, remove all daily hurt & grime, let happiness & joy be mine!" You get the idea. Use your imagination to come up with a rhyme or statement to express your intention, and chant it into the mixture for a few moments. As you stir counterclockwise and softly chantly, also visualize a powerful funnel of white or light blue or green light emerging from the herbal combination. 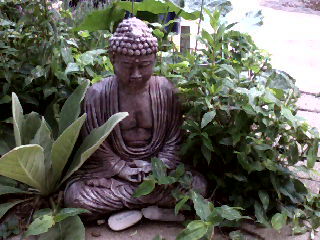 This is the purifying & healing energy of the herbs being activated & awakened. Bring 1 cup of water to a boil in a saucepan. If possible, use a glass or ceramic saucepan, as metal is said to "interfere" with the magical process. If you must use a metal plan, then simply touch the pan lightly before you begin, and intend that there will be NO interference with the creation of the infusion you are about to make. Once the water has been brought to a rolling boil, add in the teabag with the dried herbs. (If not using a tea bag, then just add directly to the water). Reduce heat. Steep at a low boil for 3-5 minutes, or until the water turns deep golden and looks like a well-brewed "tea". Next, pour the "infusion" into a glass or ceramic bowl, and let cool for a little while. 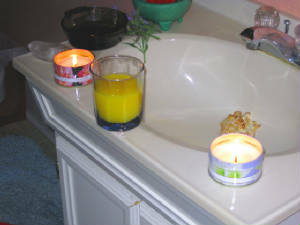 While the infusion is cooling, gather up your fresh & dried flowers for floating in the tub. It is best to use fresh flowers if available. However, if fresh flowers are not available, dried flowers can be used instead. Also, if you need to, you can substitute lavender oil for the lavender flowers. Dried rose petals are usually available at many occult or herbal stores, although fresh is best (you can always buy yourself a few roses from a local florist on the day of or before taking your magic bath). 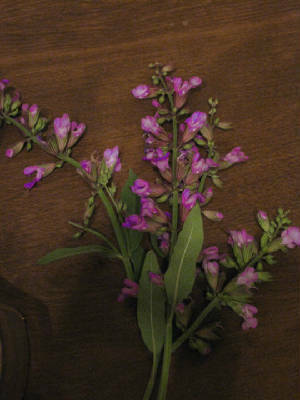 Sage flowers are harder to come by, and can usually only be acquired by picking directly out of your own garden or pulling the dried flowers from your own herbal "medicine" chest. If no sage flowers are available, you can also substitute a 1/2 teaspoon to 1 teaspoon of dried sage. This can either be placed in the bath with the fresh flowers, or added to the infusion at the time of boiling. I actually gathered both the sage flowers & the rose petals directly from my own garden immediately before taking the bath. I used dried lavender flowers, as I had no fresh ones available. 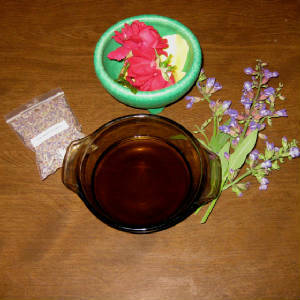 I could have also substituted a few drops of lavender oil, or even used lavender bath salts. If you are in a hurry, and need to heal a broken or discouraged heart very quickly, and don't have time to get a lot of extra ingredients, then just make the infusion. This will do in a "pinch". In fact, if you are low on ingredients, you can just make a basic infusion using the thyme & marjoram, although it will not be as powerful as when made with the cloves & lavender powder. Also, adding the flowers to the bathtub provides the most powerful & effective "cleanse" possible for your heart & your aura. In addition to the infusion & the flowers suggested above, it will also help if you have a couple of light or pastel colored candles, and a glass of orange juice, pineapple juice, or other bright colored juiced. If no juice is available at the time, or your stomach cannot tolerate fruit juice, then have a nice ice cold glass of water nearby. You may also wish to use a seashell as part of your purification & healing ritual. First, make sure your bathroom is reasonably clean, as it makes no sense to "purify" in a bathroom that is a wreck (smile). 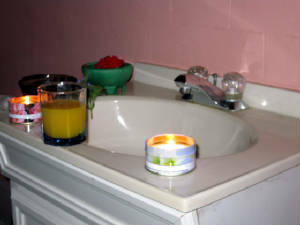 Then, light your candles, and place in a safe area in the bathroom, somewhere that they will not be knocked over, disturbed, or come into contact with anything flammable. Place the infusion and dried or fresh flowers in the bathroom. Also, make sure you have your water or juice nearby. If you are using a seashell, place it either in the bathroom sink, or in the bathtub itself. Begin to run yourself a bath. Use cool or warm water, but NOT hot. (A hot bath will destroy the cool & relaxing energies of the purification mixture). 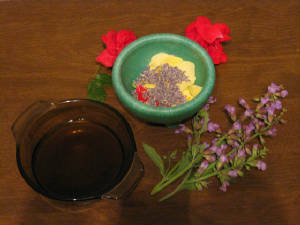 Pour the infusion into the water, then drop the rose petals, sage, and lavender into the bath as well. Sink down into the bathtub yourself, and relax. As you soak in the bath, breathe very deeply, and feel all heaviness, sorrow, pain, hurt, and discouragement leaving your body & your heart, and dissolving into the water. Feel the love & the energies of the flowers and herbs little massaging your heart, and scrubbing your cells clean of all cellular memory of pain, hurt, resentment, regret, or discouragement. Breathe into it, and let yourself go into the process. Painful past memories may come up to be released. That's OK. Just breathe, and let them go. Sip on the water or the orange juice as you relax into the process. Feel your heart being cleansed, purified, and healed. You may feel like there is a "film" of sorrow or emotional "grime" being lifted away from your body. You may also feel chunks of "stuff" leaving your field, or some other kind of sensation of "cleaning" and "purification". You may also feel nothing at all. Whatever you feel is just perfect for you. Experience a sense of renewal & rebirth. After awhile, you will probably notice a *lightness" coming over you. Or you may shift from thinking discouraging negative thoughts, to much more positive, uplifting thoughts. You may also experience a sense of relief & release, or just have the feeling that you are "done". In any case, after a little while, you will get the distinct feeling that you have released all that you can in the present moment. Once you feel that you are done, go ahead and pick out as many of the wet flowers as you can from the bath, and place them into the emptied bowl that you used to hold the infusion (this is to help keep your drain clear). Pull the plug, then imagine that all of your worries, cares, and previous discouragements being sucked down the drain. Once the water has been drained away, go ahead and take a shower, washing your hair & your entire body. As you shower, feel any last remants of emotional pain, sorrow, or discouragement being washed away. When you are done, thank the herbs & flowers for their service to you. 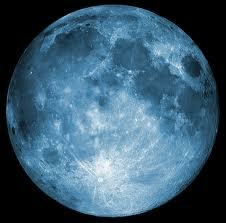 Thank your higher power, as well as your angels & spirit helpers, for assisting too. 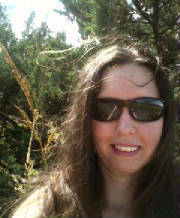 Thank God for your life, and for the life of the healing plants. Go ahead & blow out your candles, thanking fire for assisting you in your purification & renewal. Dry off with a white, pink, green, or blue towel. Dress immediately in white or light-colored clothing that is very free flowing. Place the bowl of wet flowers on an altar to dry, or scatter outside on the ground, thanking the herbs again for their service. Then give yourself at least an hour or two to rest, and to "process" the purification that is occurring within you on an emotional & physical level. If you can, take it easy for the next couple of days. Be gentle with yourself, and allow the encouragement & healing to make its way into your life. It is best to perform this bath in the "waning" of the moon, or when the moon is between full & new, although if the need is urgent, it can be performed at any time. Also, if your hurts or discouragment runs very deep, or if you keep finding yourself getting RE-discouraged, you may need to repeat the bath. When repeating, it is best to do it an odd number of total times....3, 5, 7, etc. Also, allow at least a few days between follow-up baths, if at all possible. This will give your energetic being time to adjust to the emotional & spiritual release.